The University of California, Davis is one of the greenest schools in the nation. In addition to being named the No. 1 Coolest School by the Sierra Club in 2012, former Gov. Arnold Schwarzenegger called UC Davis the “Environmental Capital of the World” in a speech at the Governors’ Global Climate Summit in 2010. With this reputation, it's no wonder the university’s transportation system, ASUCD Unitrans, has been on the path to be a sustainable fleet since 1995, the year a compressed natural gas (CNG) fueling station was installed at the maintenance facility located on campus. After the development of the station, Unitrans began building its green fleet with the purchase of its first CNG-powered Orion buses. Though this campus unit is almost entirely run by students, including drivers, dispatchers and shop assistants, who were not necessarily familiar with CNG or the related equipment at the time, implementation went smoothly. 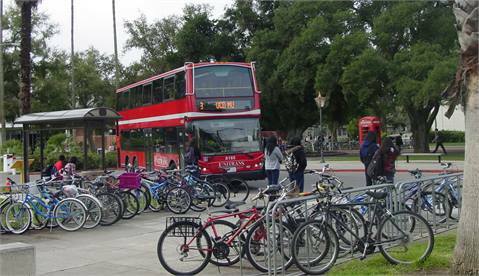 Today, Unitrans' environmentally-friendly buses provide public, fixed-route transportation for the university and the entire city of Davis, carrying more than 20,000 passengers on a typical day. Unitrans’ entire fleet is made up of 43 CNG buses, as well as two Alexander Dennis double-decks that run on biodiesel and two vintage-style London double-decks converted to run on modern Cummins ISB engines. Included in the CNG fleet is one successfully retrofitted 1950s-era London double-deck running on a John Deere CNG engine, with another is in the works. The unit’s support vehicles also adhere to UC Davis' strict green standards, with two CNG Honda Civic sedans, several CNG paratransit vehicles and a recently added Toyota RAV4 EV. And to encourage and nurture green transportation beyond the Unitrans fleet, the unit fuels other campus vehicles at its CNG station, including the campus refuse trucks. With the majority of employees being part-time student workers, including more than 250 total students employees, the task of maintaining and operating a CNG fleet might seem daunting, especially when most people rely so heavily on petroleum-fueled vehicles in their day-to-day lives. In actuality, the Unitrans staff has made this look easy by employing knowledgeable career staff who educate the students appropriately throughout their time with the unit. Many students eventually hold positions of increased responsibility within the organization, such as supervisor, driver trainer, shop assistant, and even operations and human resources manager. This work experience, coupled with their excellent educational experience at UC Davis, leaves much of the graduating student staff ready to enter and be successful in the workforce, regardless of their field of study. In partnership with the City of Davis and UC Davis, Unitrans hopes to continue to be a leader in environmental and sustainable projects, decreasing the size of its carbon footprint and setting an example for many other fleets. Many believe that if public transportation can pave the way for automotive sustainability, more sectors will follow. Thanks to Andrew Wyly and Anthony Palmere of Unitrans for their valuable contributions to this post. Read our METRO blog, "What the 'Google Bus' has taught us." Sustainable transit continues to be a hot topic among city leaders and transit officials, but more often than not, equitability is left out of the conversation.